Electrophotonic analysis in medicine is something that’s been gaining more attention from scientists and researchers from all over the world. It’s one case -of many -that demonstrates how humanity is continually moving toward a scientific understanding of what is considered Ancient Eastern Mysticism. It does this by using a completely painless electrical current applied to the fingertips, which takes less than one millisecond. How the body responds is measured in the form of an “electron cloud” that’s composed of light energy photons. The glow of this discharge is invisible to the human eye, (humans can only see one percent of the entire electromagnetic spectrum) and is captured by an optical CCD camera system and then translated into a digital computer. For more information on this device, please examine references (2),(1) and (3). In the GDV software programs, the glow from the different sectors of the finger images is projected onto the shape of a human body in correspondence with the location of the different organs and systems. 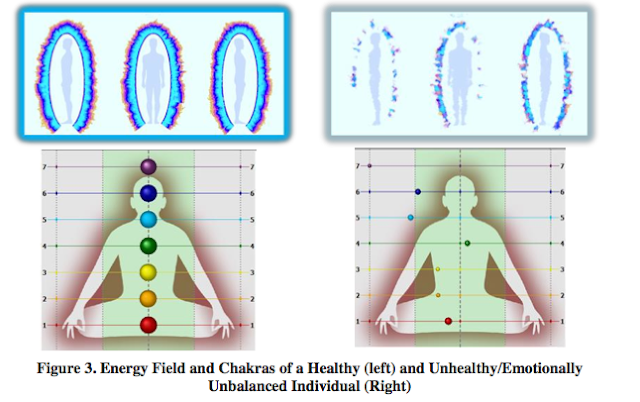 As a result, energy field images are produced that allow for intuitive analysis of the physiological level of human body functioning. 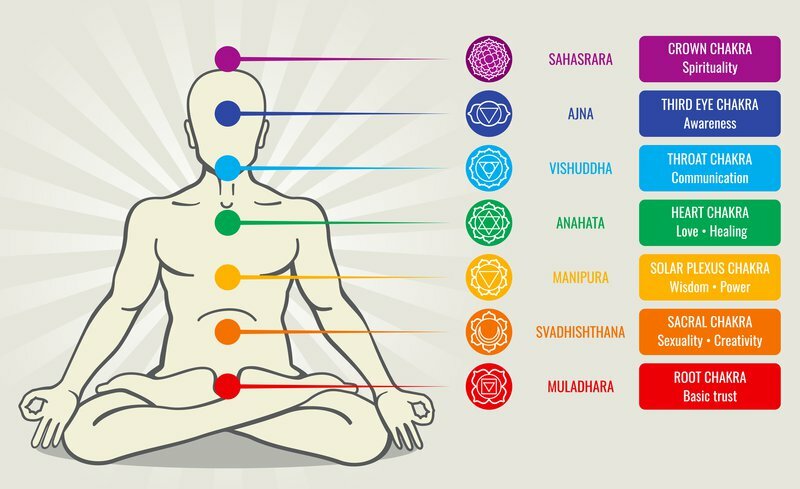 According to eastern metaphysical theories of Ayurvedic Indian medicine, there are seven “Chakras” or integrated energy centers that are considered to be correlated with physical, mental, emotional and spiritual well being. These energy Chakras are positioned or embedded into the spinal column at various locations beginning with the coccyx, rising all the way to the crown of the head. The aligned Chakras indicate that the subject was calm, relaxed and nourished from their participation in the case study, which involved information on meditation, breathing practices, love, kindness and intention. You can also observe a smoothing of the energy field before and after the case study work shop. Results like this were consistent with a number of volunteers. In this case, a healthy and balanced emotional state is correlated with truthfulness, honesty, steadfastness, equanimity, unconditional love, compassion, gratitude, the ability to discern truth from falsehood, spontaneous affection, and the capacity to remain calm despite what’s occurring in the external world. An unhealthy and emotionally unbalanced state is correlated with attachment, ego, greed, lying, fear, anger, irritation, sorrow and more. This is another example of how consciousness is directly correlated with our physical material world, with regards to health and much more. Click here to view 10 other scientific studies that prove consciousness can alter our physical material world. I find it intriguing how our world deems the realm of science as absolute truth, yet phenomenon deemed to be 100 percent truth seems to need scientific validation behind it. Although I disagree with this notion, the scientific studies now emerging that prove these intuitive ‘knowings,’ still hold great importance, and can help open the minds of those who look for this type of validation. As we move forward, no doubt we will be moving into an ancient understanding with a modern day scientific twist. Ancient wisdom is returning to humanity, and we must be able to clearly see how acting from a place of peace is vital to transforming our external world. (2) Jakovleva E, Korotkov K., Electrophotonic Analysis in Medicine. GDV Bioelectrography research. 2013. 160 p. Amazon.com. (3) Pehek J. O., Kyler, H. J., and Foust, D.L., Image Modulation in Corona Discharge Photography, Science, Vol. 194, 263-270, October 1976.